Tooth decay is one of the biggest dental problems. It affects individuals of all ages and although it is possible to reverse tooth decay in its early stages, it can cause several complications if left unattended. In severe cases, Mississauga dentists prescribe different types of treatment options depending on your individual needs. One of these prescriptions is a root canal treatment. Tooth decay is basically a result of weakening and destruction of the enamel that forms the outer layer of the teeth. Mostly, the cause is accumulation of plaque which is an accumulation of bacteria that will coat your teeth especially after consuming drinks and foods rich in sugar. If your tooth contracts an infection or decays, root canal treatment is the way to go. The term ‘root canal’ refers to the natural cavity at the center of your tooth. Inside, there are the nerves of the tooth as well as the pulp. Your teeth are capable of functioning without the nerves but the pulp is the one that allows your teeth to experience various sensations, such as the temperature of the food you consume. Root canal treatment on the other hand, is the process of drilling a hole in the tooth so as to access its natural cavity. After this, Mississauga dentists remove the pulp, clean the inside of the tooth and seal it to safeguard it from further damage. It is necessary to remove the pulp since it can house more bacteria and cause even more damage to your infected tooth. If allowed to stay inside your tooth, it can facilitate the development of pus in the cavity, causing bone loss and swelling. Depending on the factors surrounding your condition and its severity, a Mississauga dentist or endodontist may perform the root canal procedure. It usually takes a few visits to the dentist to complete a root canal treatment. First, the dentist has to take an X-ray of your mouth in order to establish the shape of your root canal as well as the progress of the condition. Your dentist will then apply local anesthesia to the area adjacent to the infected tooth and drill an access hole at the side of your tooth. It is through this that they will be able to remove the decayed nerve and pulp. Finally, they will clean the tooth and fill it. 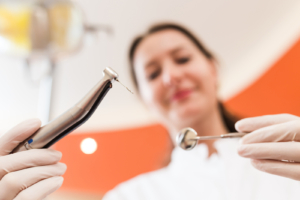 Mississauga dentists may recommend restoration of your tooth with the use of a crown. This will help return your tooth to functional condition and make the previously infected tooth inconspicuous. Generally, a root canal procedure is reliable. Teeth operated on can last a lifetime and although the procedure is painful at times, the discomfort you will experience is similar to that of a normal filling. Female dentist using a drill for the root canal treatment. How do you handle the after-effects of a root canal treatment? After a root canal treatment, you can expect your tooth to feel very sensitive. This is normal and is as a result of swollen tissue. Your dentist can prescribe pain relievers to address the issue and you can find out from them when you can resume your daily routine. Try as much as possible to avoid straining the operated tooth by refraining from chewing hard foods. Ensure that you maintain good oral hygiene by brushing and flossing your teeth regularly to keep germs away. Mississauga dentists also recommend that you visit yours periodically to ensure that your teeth remain at their best always. Root canal treatment is an incredible procedure that offers proven results. It provides you with an opportunity to save your teeth from the harmful effects and dangers that tooth decay brings with it. Prevention is always better than cure and as such, it is advisable to keep your teeth clean and healthy so as to avoid having to stress over tooth decay in the first place.